SFB2 GRAPHIC COMPLETE WOODEN FINGERBOARDS - FINGERBOARD STORE -WOODEN FINGERBOARD COMPLETES, BEARING WHEELS, RAMPS, WOOD FINGERBOARD DECKS, TUNING, FINGERBOARDING, FINGERBOARD WHOLESALE, FINGERBOARD BAG & MUCH MORE! THIS IS OUR SFB2 GRAPHIC "POP" COMPLETE WOODEN FINGERBOARD WITH BEARING WHEELS. YOU WILL GET THE DECK, YELLOW BEARING WHEELS, BLUE TRUCKS, BOLTS/SCREWS, TOOL, AND A PIECE OF OUR SUPREME PRE-CUT FOAM GRIP TAPE. COOL LOOKING COMPLETE! THIS IS OUR SFB2 GRAPHIC "SKELETON" COMPLETE WOODEN FINGERBOARD WITH BEARING WHEELS. YOU WILL GET THE DECK, BLACK BEARING WHEELS, YELLOW TRUCKS, BOLTS/SCREWS, TOOL, AND A PIECE OF OUR SUPREME PRE-CUT FOAM GRIP TAPE. COOL LOOKING COMPLETE! 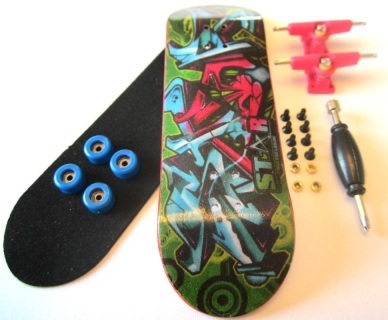 THIS IS OUR SFB2 GRAPHIC "GRAFFITI" COMPLETE WOODEN FINGERBOARD WITH BEARING WHEELS. YOU WILL GET THE DECK, BLUE BEARING WHEELS, CHROME TRUCKS, BOLTS/SCREWS, TOOL, AND A PIECE OF OUR SUPREME PRE-CUT FOAM GRIP TAPE. COOL LOOKING COMPLETE! THIS IS OUR SFB2 GRAPHIC "STAR" COMPLETE WOODEN FINGERBOARD WITH BEARING WHEELS. YOU WILL GET THE DECK, RED BEARING WHEELS, BLACK TRUCKS, BOLTS/SCREWS, TOOL, AND A PIECE OF OUR SUPREME PRE-CUT FOAM GRIP TAPE. COOL LOOKING COMPLETE! 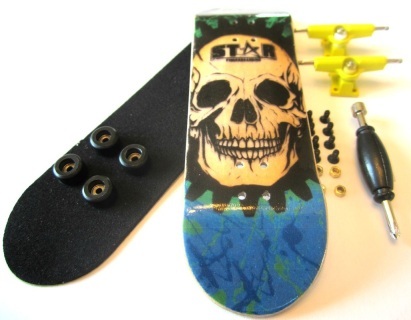 THIS IS OUR SFB2 GRAPHIC "BROKEN" COMPLETE WOODEN FINGERBOARD WITH BEARING WHEELS. YOU WILL GET THE DECK, WHITE BEARING WHEELS, LIME GREEN TRUCKS, BOLTS/SCREWS, TOOL, AND A PIECE OF OUR SUPREME PRE-CUT FOAM GRIP TAPE. COOL LOOKING COMPLETE! THIS IS OUR SFB2 GRAPHIC "GRAFFITI 2" COMPLETE WOODEN FINGERBOARD WITH BEARING WHEELS. YOU WILL GET THE DECK, BLUE BEARING WHEELS, PINK TRUCKS, BOLTS/SCREWS, TOOL, AND A PIECE OF OUR SUPREME PRE-CUT FOAM GRIP TAPE. COOL LOOKING COMPLETE! THIS IS OUR SFB2 GRAPHIC "MONEY" COMPLETE WOODEN FINGERBOARD WITH BEARING WHEELS. YOU WILL GET THE DECK, BLACK BEARING WHEELS, GOLD TRUCKS, BOLTS/SCREWS, TOOL, AND A PIECE OF OUR SUPREME PRE-CUT FOAM GRIP TAPE. COOL LOOKING COMPLETE! THIS IS OUR SFB2 GRAPHIC "MECHANIC" COMPLETE WOODEN FINGERBOARD WITH BEARING WHEELS. YOU WILL GET THE DECK, BLACK BEARING WHEELS, LIME GREEN TRUCKS, BOLTS/SCREWS, TOOL, AND A PIECE OF OUR SUPREME PRE-CUT FOAM GRIP TAPE. COOL LOOKING COMPLETE! 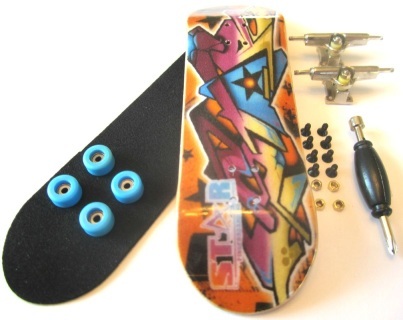 THIS IS OUR SFB2 GRAPHIC "PRINT" COMPLETE WOODEN FINGERBOARD WITH BEARING WHEELS. YOU WILL GET THE DECK, WHITE BEARING WHEELS, RED TRUCKS, BOLTS/SCREWS, TOOL, AND A PIECE OF OUR SUPREME PRE-CUT FOAM GRIP TAPE. COOL LOOKING COMPLETE! THIS IS OUR SFB2 GRAPHIC "BEARING" COMPLETE WOODEN FINGERBOARD WITH BEARING WHEELS. YOU WILL GET THE DECK, YELLOW BEARING WHEELS, PURPLE TRUCKS, BOLTS/SCREWS, TOOL, AND A PIECE OF OUR SUPREME PRE-CUT FOAM GRIP TAPE. COOL LOOKING COMPLETE! 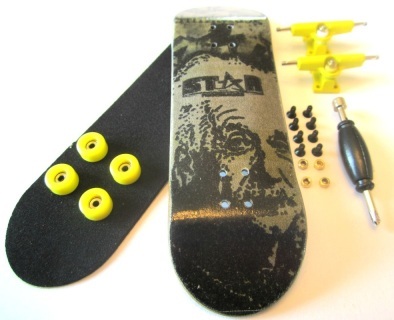 THIS IS OUR SFB2 GRAPHIC "EINSTEIN" COMPLETE WOODEN FINGERBOARD WITH BEARING WHEELS. YOU WILL GET THE DECK, YELLOW BEARING WHEELS,YELLOW TRUCKS, BOLTS/SCREWS, TOOL, AND A PIECE OF OUR SUPREME PRE-CUT FOAM GRIP TAPE. COOL LOOKING COMPLETE! 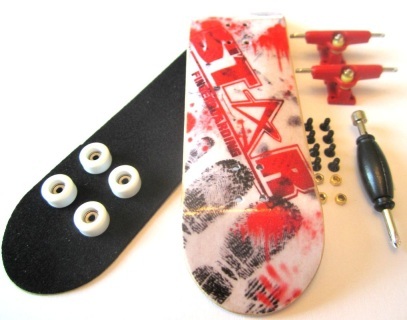 THIS IS OUR SFB2 GRAPHIC "STAR 3" COMPLETE WOODEN FINGERBOARD WITH BEARING WHEELS. YOU WILL GET THE DECK, WHITE BEARING WHEELS, WHITE TRUCKS, BOLTS/SCREWS, TOOL, AND A PIECE OF OUR SUPREME PRE-CUT FOAM GRIP TAPE. COOL LOOKING COMPLETE! THIS IS OUR SFB2 GRAPHIC "CAUTION" COMPLETE WOODEN FINGERBOARD WITH BEARING WHEELS. YOU WILL GET THE DECK, YELLOW BEARING WHEELS, BLACK TRUCKS, BOLTS/SCREWS, TOOL, AND A PIECE OF OUR SUPREME PRE-CUT FOAM GRIP TAPE. COOL LOOKING COMPLETE! THIS IS OUR SFB2 GRAPHIC "EYE" COMPLETE WOODEN FINGERBOARD WITH BEARING WHEELS. YOU WILL GET THE DECK, DARK BLUE BEARING WHEELS, BLUE TRUCKS, BOLTS/SCREWS, TOOL, AND A PIECE OF OUR SUPREME PRE-CUT FOAM GRIP TAPE. COOL LOOKING COMPLETE! 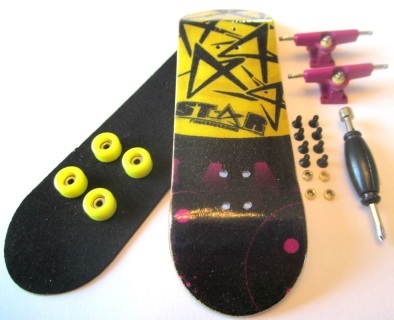 THIS IS OUR SFB2 GRAPHIC "STAR 2" COMPLETE WOODEN FINGERBOARD WITH BEARING WHEELS. YOU WILL GET THE DECK, BLUE BEARING WHEELS, PURPLE TRUCKS, BOLTS/SCREWS, TOOL, AND A PIECE OF OUR SUPREME PRE-CUT FOAM GRIP TAPE. COOL LOOKING COMPLETE!